AmaWaterways its celebrating Valentine’s Day with special offers for guests and great rewards for valued travel partners. Ama (or “Amor”) means love, and AmaWaterways is celebrating its favourite holiday with specials that include sailings on the highly anticipated AmaMagna, a revolutionary vessel that’s twice the width of traditional river cruise ships. 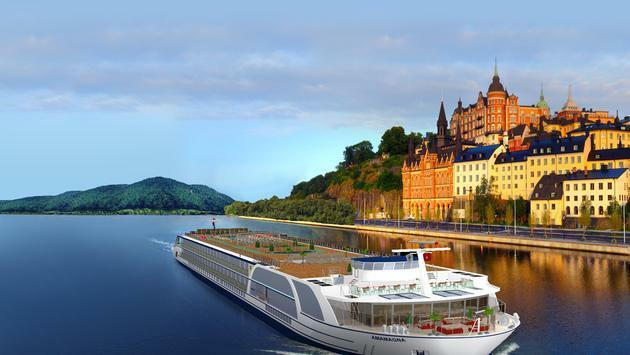 The AmaMagna will debut this May with seven-night cruises on the Danube River. With AmaWaterways’ popular Sell Five, Sail Free incentive program, travel advisors who make five new FIT bookings on any 2019 sailing can receive a free seven-night cruise*, valid on 2019 or 2020 departures. New for 2019, travel advisors who double the five FIT bookings will earn a free cruise on the extraordinary AmaMagna. Just in time for Valentine’s day, , couples who book July 21 or July 28, 2019 departures on board AmaMagna can save up to CA$1,440 per stateroom, or book one of the ship’s ocean-style, triple occupancy suites and bring a third guest sharing the suite for free**. Ideal for multigenerational families or a group of friends who are looking for an unforgettable vacation, the long awaited AmaMagna features a total of 98 staterooms, most of which are spacious suites measuring between 355 and 710 sq. ft., which can be comfortably shared with that special someone. In addition to AmaMagna’s special offer, AmaWaterways is delivering WAVE savings of CA$240 per stateroom on select 2019 Europe, Southeast Asia and Christmas Market sailings***. Available through March 31, 2019, WAVE savings can be combined with existing retail offers and savings for past guests. Apart from the spacious suites on board the extraordinary AmaMagna, guests can look forward to two enticing new dining venues complementing the Main Restaurant and the intimate Chef’s Table: Jimmy’s, family-style dining named for AmaWaterways’ late co-founder Jimmy Murphy, and the Al Fresco restaurant, with retractable ceiling and windows for guests to indulge in the views of the picturesque Danube river and the towns that dot its shores. A robust complementary daily excursion program including escorted hiking and biking tours and group fitness classes lead by a trained Wellness Host offer guests the ability to personalize their river cruise experience. Additional features include a Sun Deck with a heated swimming pool, an expansive Zen Wellness Studio with massage, hair and nail salon services and an innovative Water Sports Platform. *Offer is valid on new bookings made January 1 through December 31, 2019. Bookings must be paid in full and traveled in 2019 to apply, with groups counting as one booking. Complimentary seven-night cruises are valid on advertised FAM cruises or cruises departing within 60 days (based on availability; excludes Portugal and Africa). Visit AmaWaterways’ Travel Advisor Portal for full terms and conditions. ** Use code FREE3 to receive third guest free. Applicable on SA and SB suites only. See website for full terms and conditions. ***Offer is valid on new bookings made January 1 through March 31, 2019 on select sailings and excludes Wine Cruises. Use code WAVE19 to receive CA$240 per stateroom savings. See website for full terms and conditions. For full details, or to book an AmaWaterways river cruise, visit AmaWaterways.ca or call (800) 626-0126.